Your friend has a birthday coming up, but what do you get them? If you’ve been friends a long time, you might be running out of ideas, or perhaps they’re just hard to buy for in general. What if you got them a unique birthday gift basket this year? Gift baskets are full of fun goodies (food!) that they’ll be sure to love. Even the friend who has everything will be impressed. There are so many to choose from, but here are our top three faves. How cute! Packed in these reusable hat boxes are tons of delicious goodies, and a cute little friend. This basket includes hand-decorated cookies, wine glace’, white chocolate macadamia cookies, and American Vintage Wine Biscuits for a truly delicious experience. Not only is this gift yummy, but the hat boxes can be reused for any number of things. This adorable gift basket is perfect for the friend that loves ice cream. Included in this gift are ice cream shaped sundae bowls, ice cream embroidered hand towels, a sweet ice cream serving tray and Hershey’s Double Chocolate Sundae Syrup. Yum! We all have that friend that considers themselves a beer connoisseur. This basket contains a collection of six beers in your choice of imported or American IPAs and an assortment of pub grub to pair with them. This unique birthday gift basket is also great for 21st birthdays! 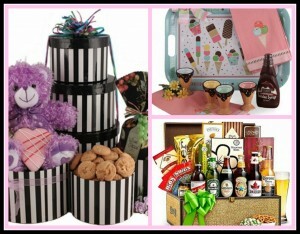 Give your friend the best birthday ever with a unique birthday gift basket from BisketBaskets.com! Sweet Summer Spa Gift Baskets for Women! Summer is in full swing, with ‘flip flop weather’ officially carrying into the evening almost every day of the week. Most of us are spending as much time as possible in front of a fan, basking in air conditioning, or appreciating some relaxing, rejuvenating time poolside or lounging on a beach (the lucky ones!) Most of us are also spending less time shopping than we do any other time of year. After all, who wants to climb inside a hot car and take a trek to the mall when the temps are holding steady in the 90s and there’s iced tea begging to be sipped by the water? Not me! And chances are good that it’s not you, either. Watermelon Themed Gift Basket: The ‘summeriest’ of all summer fruits, you’d be hard pressed to find someone who can resist a sweet slice of watermelon. And not only does this fruit taste amazing, but it smells oh-so-fresh as well. Our ‘Sweet Scent of Watermelon’ gift set is as adorable as it is useful, packed with a colorful watermelon dishtowel and watermelon hand soap and lotion, which are tucked inside a chrome plated reusable sink caddy. Great for birthdays, hostess gifts, ‘thank you’ gifts, or just because, this brings all the sweet with none of the seeds! Tranquil Bath & Body Spa Gift Basket: This indulgent basket truly has it all – everything she’ll need to relax in a much-needed bath at the end of an exhausting summer day! Swimming in the scent of sweet pea, you’ll find shower gel, body lotion, bar soap, body butter and foot cream. And if her tootsies need a little extra pampering all their own, our exhilarating peppermint foot soak will get the job done with the help of the included foot brush – bye-bye rough heels! We round out this lovely lineup with a sumptuously soft satin eye mask and hair towel so she can drift into dreamland peacefully post-pampering. There’s many ways to bring joy to a loved one on their birthday, some wrapped in a box, better ones not. Finding that perfect gift can be hard, especially for those you’ve known for years. Often you find yourself searching through stores for that perfect gift, and those you haven’t stayed in touch with end up with a generic gift. Unique and memorable gifts can be hard to find. Why not leave the less personalized birthday gifts behind, and instead think of those you know would enjoy a wine gift basket and make theirs a happy birthday. Many parents, uncles, aunts, and friends would love a gift of wine, cheese, and crackers to enjoy their special day with. For others, a basket full of treats will allow them to share a basket of goodies with loved ones will only make their special day more special. There’s nothing better to celebrate a year of growth with than a bottle of wine and quality cheese spread. Balloons, cake, candles and wishes…sounds like a party right? Birthday parties are wonderful celebrations of love and growth, which gives you even more of a reason to make the most of yours this year. Instead of stressing over what kind of birthday party to have, choose instead to host a gathering that’s all your own. Let it come together with your menu choices, your personal style, and your attention to detail. Trust us, it’ll definitely be an event to remember. Having a unique birthday party can be easier than ever, as long as you remember to trust your instincts and go with what details work best for you. Furnish your guests with treats and surprises that capture the festive spirit of the day using creative techniques or even non-traditional materials. Give your friends and family a memory that will last a lifetime. Celebrate your birthday with a sense of personality and creativity and it’s sure to be an occasion to remember. To help make your birthday even more memorable, BisketBaskets.com offers Candy Bouquets and Cookie Bouquets that are perfect for adding dimension to your occasion. Simply place them as fun centerpieces in the middle of your tables and you’ve got a decoration and a set of party favors all in one! At BisketBaskets.com, we’re always looking for new ways to share our gift giving experience with you! Check us out over at Ning.com at Gift-Baskets.Ning.com – we have tons of great photos, links to jam-packed gift baskets, as well as a forum for you to speak up! Head on over to Ning! Princess parties are a great way for your little girl to celebrate their special day. Whether it’s a birthday, an all-star report card, or grade school graduation, a princess party is the perfect way to celebrate. Send out royal invitations that declare a celebration in honor of your little princess. Check with your local party supply store or invitation shop for some fancy ones that are shaped like scrolls or feature calligraphy. Serve up delicious party snacks as well as elegant sandwiches for a special touch. An easy way to make your party sandwiches fit for a queen is to cut the crusts off or to decorate them with fancy toothpicks. Display your chips and dips in fancy china and serve up pretty cupcakes for dessert. Personalize each cupcake with your party guest’s names or add on little plastic crowns or jewelry as a special favor. Finally, treat your little princess to a Pink Candy Bouquet that’s just divine!